Independent lens maker Tokina name their lenses somewhat cryptically. The $680 AT-X Pro 116 DX II is a APS-C format lens with a focal length of 11-16mm and f/2.8 maximum aperture and is a revision of the similarly named AT-X Pro 116 DX. On a Canon APS-C camera, with its slightly smaller than standard size sensor, it’s the equivalent in 35mm format to a 18-26mm, on a Nikon DX format DSLR, it’s a 17-24mm. Although the optical construction remains unchanged (it includes two elements with aspherical surfaces and two low dispersion glass elements), the lens adopts a new multi-coating process that delivers smoother gradation of the shadows, the firm claims. Besides that, the only other revision pertains to the Nikon mount version, which now includes the same high speed and quiet DC motor found on the Canon mount model. With a DxOMark Score of 15 the Tokina AT-X PRO 116 DX II is a solid performer but, it scores one point less than its predecessor when measured on a Nikon D7000. While the new model has slightly lower vignetting (measured at -1.1EV previously) the new model has slightly worse transmission and CA (up from 22 microns). 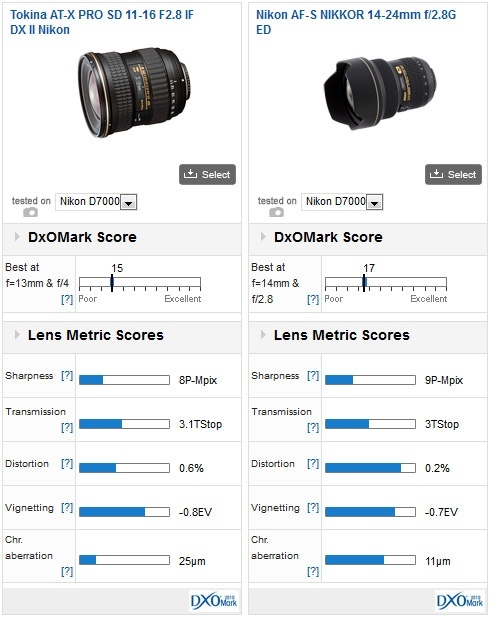 Fortunately, the sharpness score remains unchanged and, perhaps more importantly, the image quality is now more consistent throughout the zoom range. 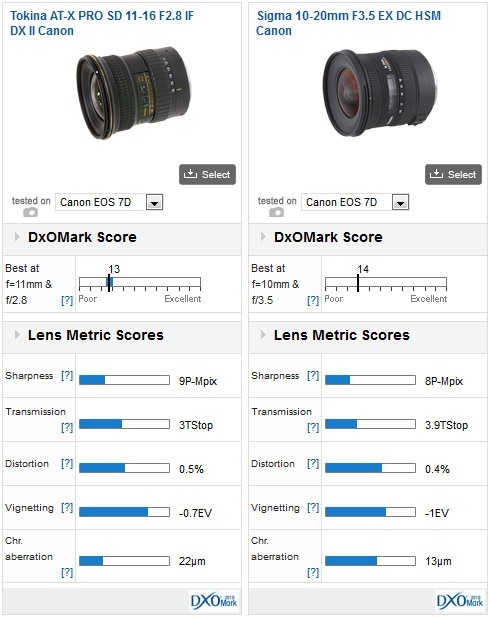 While the Canon mount version has a slightly higher Sharpness score, and lower CA when measured on the Canon EOS 7D compared to the Nikon combination, the optical quality is in fact very similar. 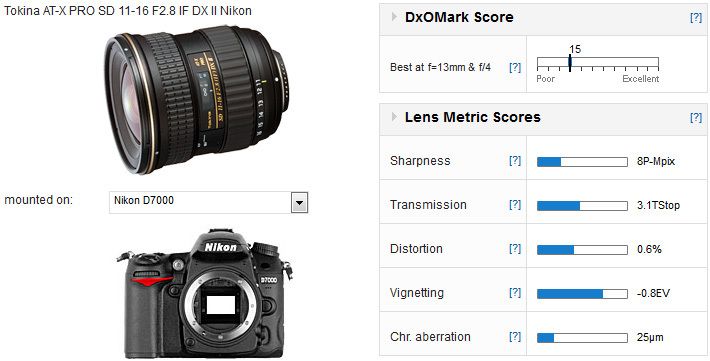 As with the Nikon mount version however, the DxOMark score, is two points lower than its predecessor and for pretty much the same reasons. 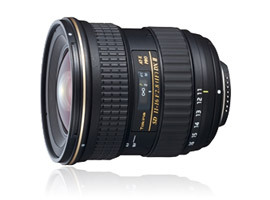 Comparing the Nikon mount model to its closest rival, the full-frame Nikon AF-S Nikkor 14-24mm f/2.8G ED the Tokina is very close in performance. It can’t quite match it for Sharpness nor Distortion and CA remains a concern but overall the Tokina remains impressive (and a viable option given the difference in price and portability). In our second comparison, we’ve selected the Sigma 10-20mm f/3.5 EX DC HSM to contrast the performance (as it’s also available in other mounts, not just Nikon). Overall uniformity of the Sigma is better than the Tokina but it can’t quite match it on Sharpness, Transmission or Vignetting. 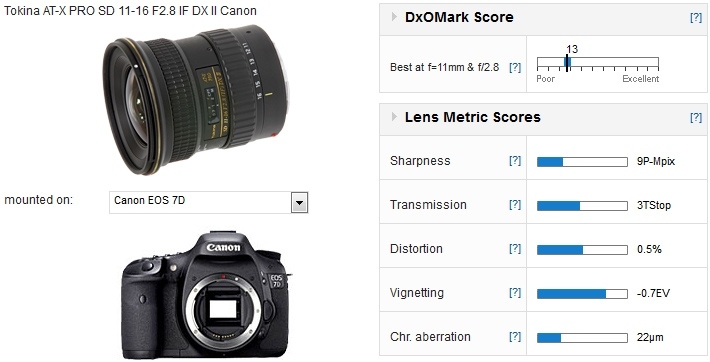 However, it has far lower levels of Chromatic Aberration and comes just slightly ahead in our DxOMark Score. It’s also around $200 cheaper at $479. While the newer version can’t quite match its predecessor in overall sharpness, Tokina has improved the overall uniformity of the lens, and if you’re a Nikon user the inclusion of a AF motor (over the older screw-type AF system of earlier Nikon bodies) seems promising. Despite the slight drop in performance, the constant f/2.8 aperture remains the principal attraction and at the price it still represents good value.